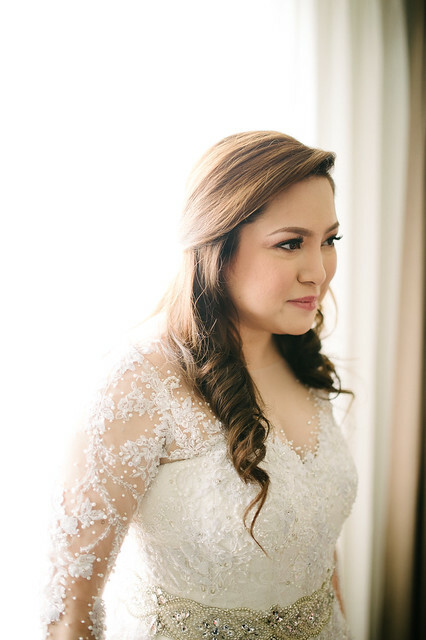 OUR BEAUTIFUL MONTECITO NUVALI WEDDING - I Blog, Therefore I Am. 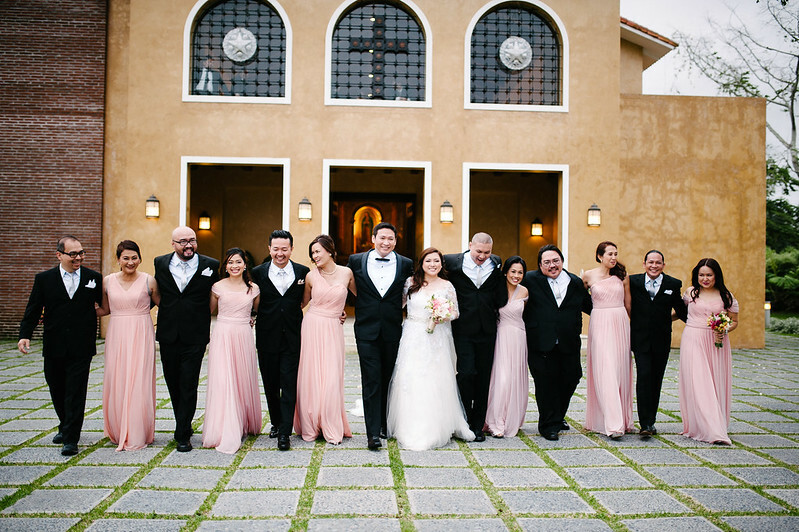 Montecito Nuvali was one of our best-kept wedding secrets. It took a significant amount of control on my social media self not to post a photo or too many details about it in the one year that we prepared for our December 2015 wedding. Yes - this blog post is one year and six months delayed! Warning: Super long post with lots of pictures ahead! 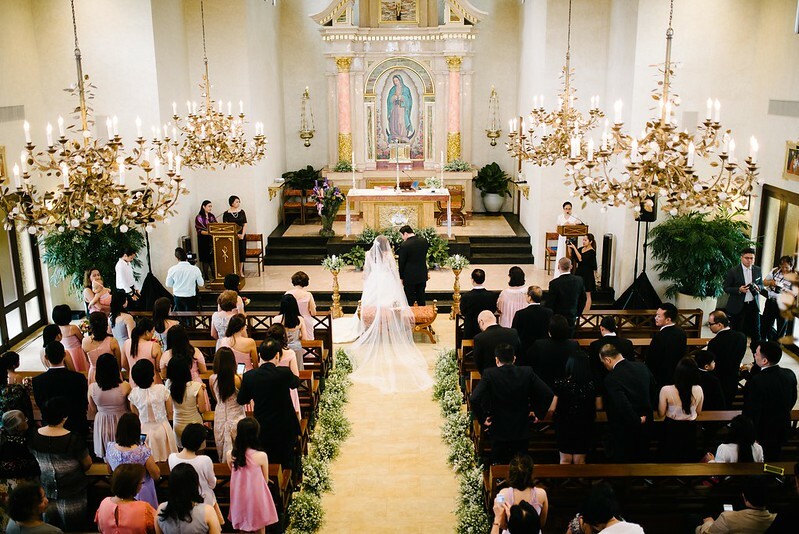 I've always wanted to get married in a quaint little church that is not too popular or mainstream. 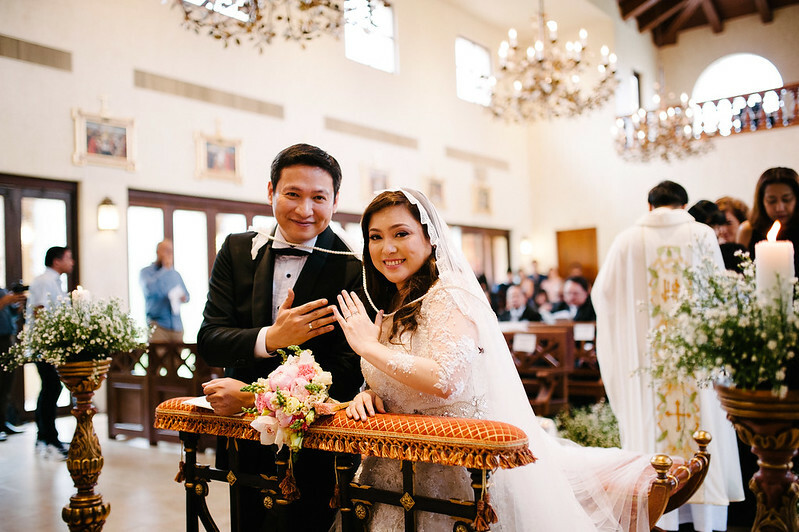 I was reading Town & Country on my iPad in late 2014 when I chance upon a wedding article where Montecito Nuvali was the church and reception venue of the couple. I got interested in the chapel instantly. I knew right there and then that this can be "the one." Unfortunately, there is very little information about it online, so it was tough for me to do my research without going all the way to Nuvali in Sta. Rosa, Laguna. This is also the reason why I am doing a very lengthy post about it. I've been getting 2-3 e-mails and messages a week from brides and grooms about this charming place. I fell in love with the place the minute I saw it, and it took very little to get the fiance on board. We were dead set from the very start that we will have our wedding in Montecito the first time we laid our eyes on it. 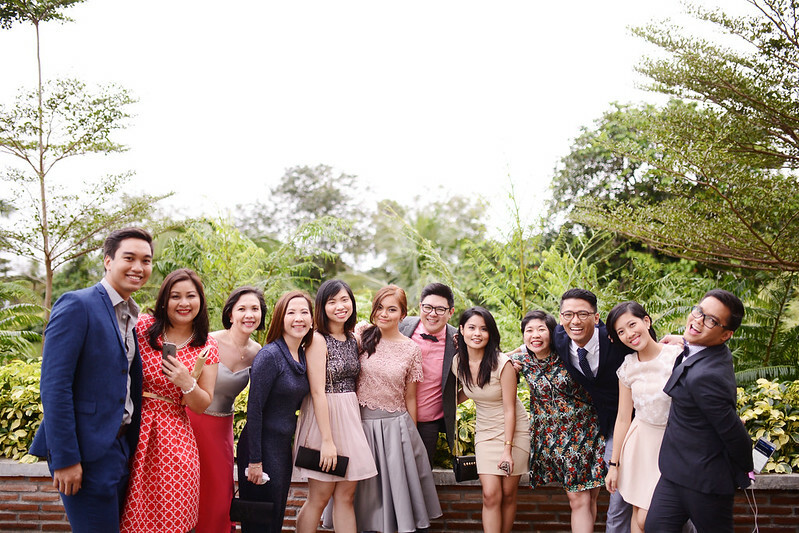 We only visited two churches for our wedding with St. Benedict Church in nearby Silang as back-up. I am just happy that everything fell into place. The church is very intimate, the outdoor lawn is perfect for our dream garden reception, the location is prime & very exclusive, and it's located in Laguna where Witt and I both reside. Having our wedding in Montecito is the best and easiest wedding decision we ever had. Our guests seemed to agree because I heard nothing but praises for it (well there were some who complained about the distance but - for us - it adds to the appeal and exclusivity of the place). Montecito Village is co-owned and managed by Ayala Properties and the Yulos of Canlubang. The chapel, Our Lady of Guadalupe, was built by the family as their personal sanctuary. 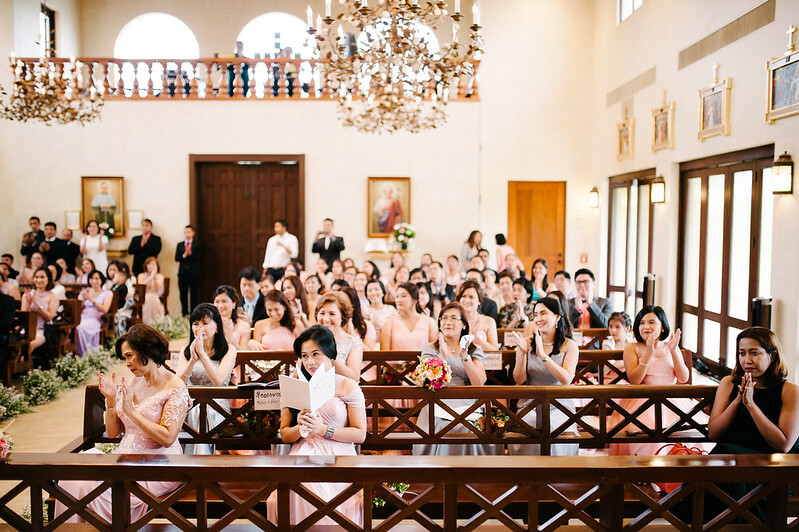 The Pasa Tiempo Clubhouse is just a few walking meters from the chapel where our reception was held. There are also options for cocktails and reception in the Main Social Hall, but we opted for the Lawn Area near the pool for a more garden feel. Montecito is an exclusive gated village in Nuvali in Sta. Rosa, Laguna. Montecito itself is already in Canlubang, Laguna but the more scenic route is in Sta. Rosa. You will need a sponsor with a supporting letter to Montecito to even have an ocular. I was very very fortunate that a friend of a friend is a Yulo who gladly sponsored us. The chapel of Montecito Nuvali is Our Lady of Guadalupe. It's located in the center of the village on top of a mini hill. It's a quaint little chapel that only sits around 150 people. There were 9 rows of pews per side, and each pew can sit about 7-8 people. The chapel is exquisite and you can do away with the elaborate flower arrangement. 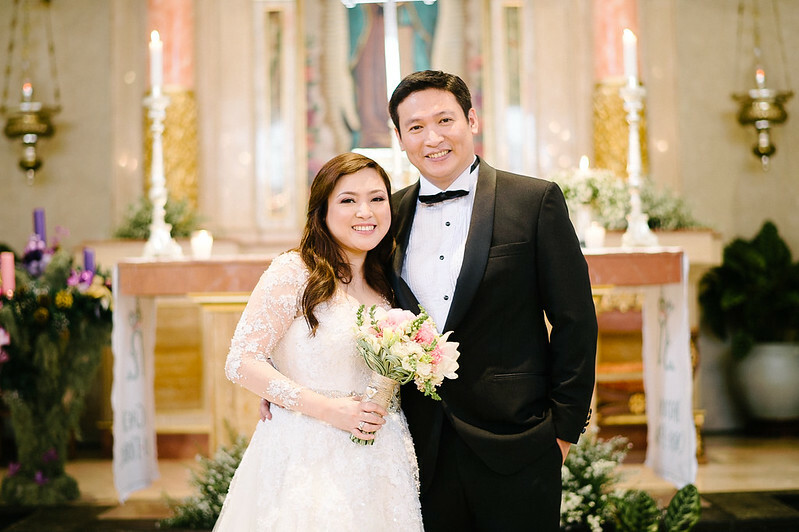 We opted for very simple aisle flowers and a couple of centerpieces in the altar. Putting too many flowers and decorations will take away the natural grandiose of the place. The ceiling is adorned with antique chandeliers, and there's a charming loft for your choir or strings. It's also good for overhead photos of the ceremony. 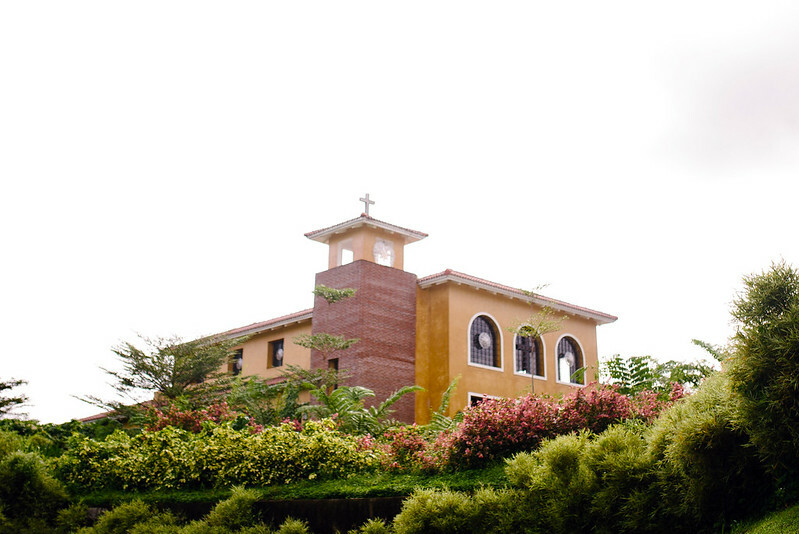 The chapel is under the parish of St. John Bosco located in Laguna Technopark. 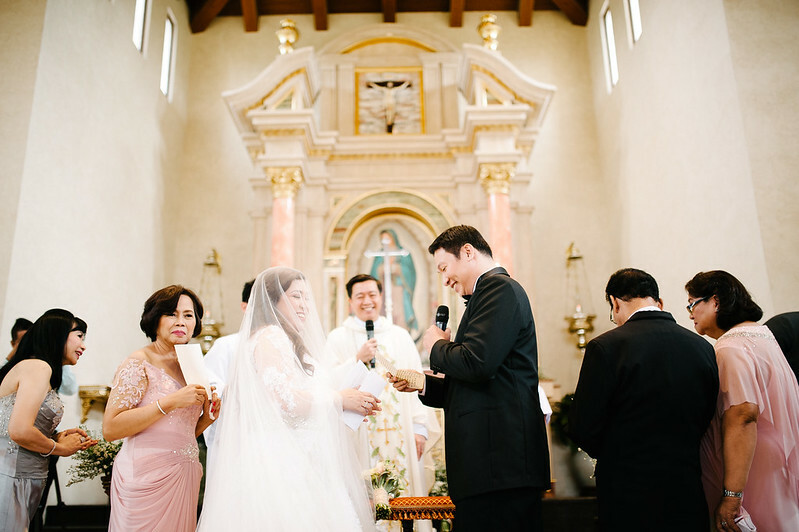 We had all our church requirements, parish interviews, and even the processing of our marriage contract through the church's office. The parish priest, Fr. Bob Roxas, was the one who did our Canonical Interview 2 months before our wedding while our Pre-Cana seminar was with our own parish. We just submitted the certificates and other pre-wedding requirements days before the wedding. 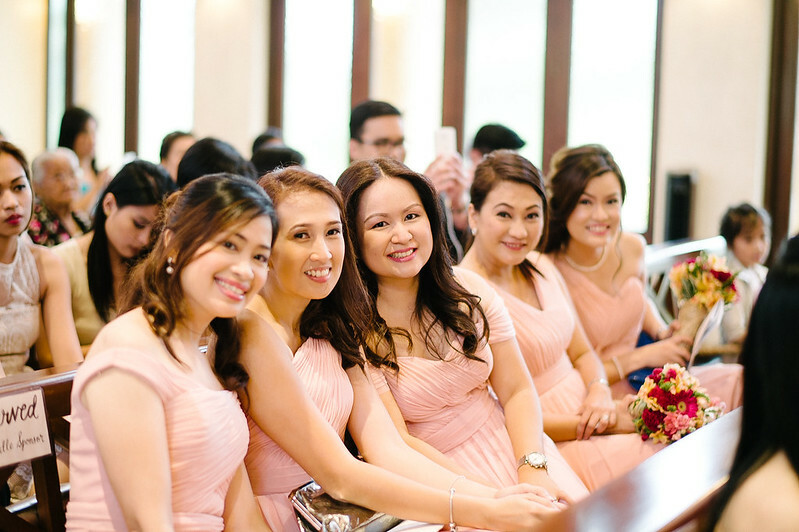 You might need to visit St. John Bosco 6-8 months before your wedding to get all the requirements and to schedule and arrange the seminars and interviews. You also have to tell them if you will ask one of their priests to officiate the wedding. In our case, we asked a family friend priest to celebrate our wedding. This would require additional requirements like the priest's license number. I also coordinated with our priest the wedding missalette which we used at the wedding. St. John Bosco is pretty okay with the requirements since Our Lady of Gudalupe is not their own parish but you must clear everything with your officiating priest. 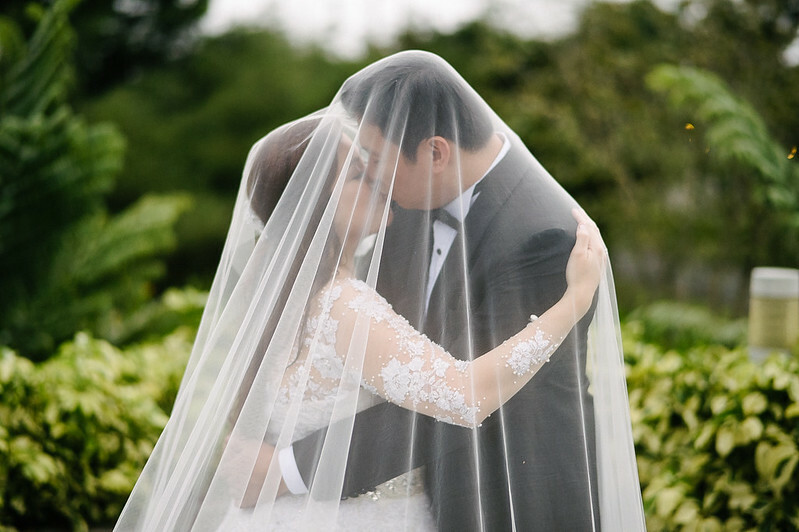 We were very blessed because we were able to read our personal vows during the wedding ceremony and I got to choose my bridal march (Lea Salonga's "Two Words"). Our Lady of Guadalupe has a complete set of altar requirements needed for the mass. 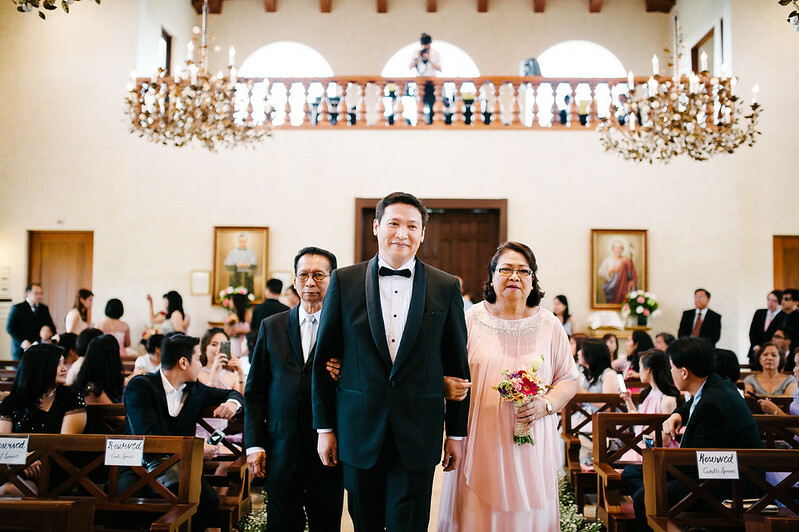 My mom, who's very active in church affairs, personally went to the chapel two days before our wedding to make sure that we have all the needed stuff for the mass. They have all the necessary things, and we just added things like the host and wine for the congregation. We also asked our lights and sounds supplier to provide additional speakers and microphones for Leggiero (our strings) since they only have microphones in the altar. The ceremony began promptly at 3:00 pm and we were done before 5:00 pm. These include all the family and friends' photos and even the throwing of bouquet which we held outside the church after we came out. 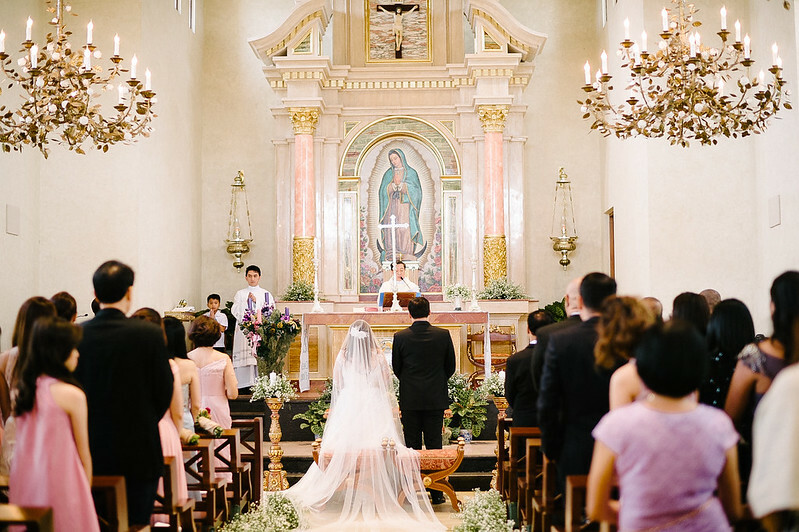 Our Lady of Guadalupe is not strict with the time of the wedding as long as they are informed of the schedule beforehand. I believe that they only allow just one wedding a day. 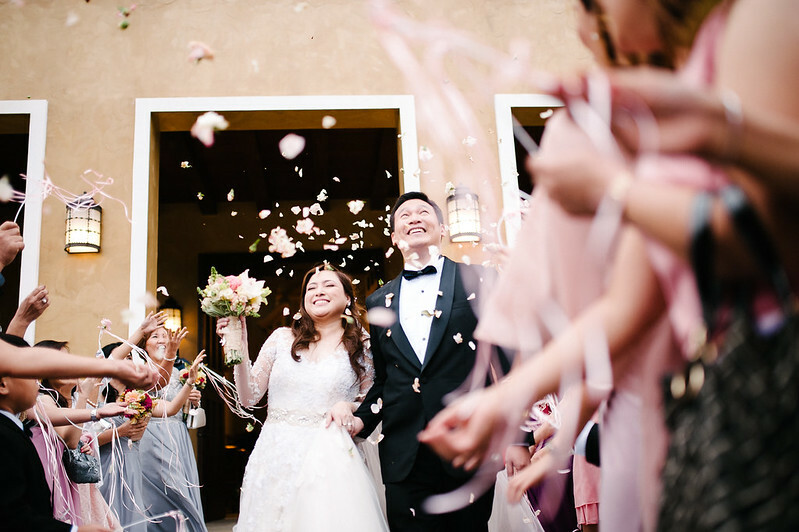 Montecito is not that popular yet when we reserved in December 2014 for our December 2015 wedding. We changed our dates once or twice, and we were still accommodated. We were only the second couple who booked for a December wedding when we reserved a year before. They ended with 4 weddings in December that year. 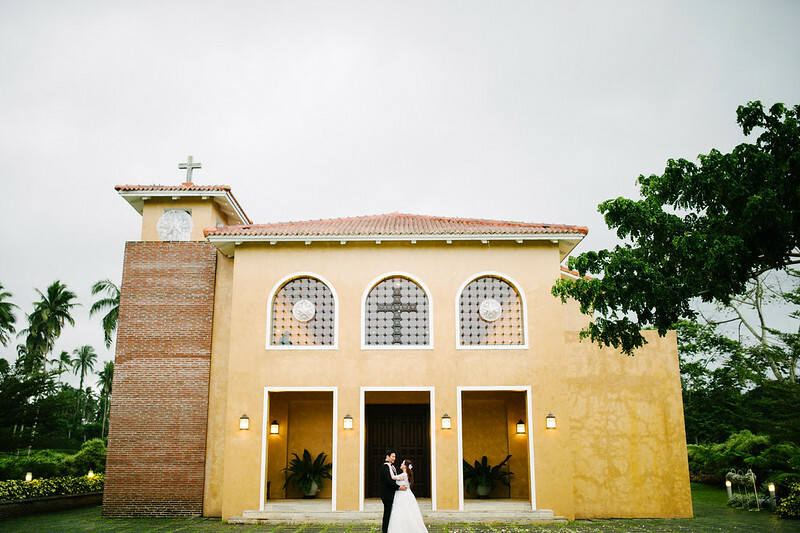 We had the reception at Pasa Tiempo which is only a few feet away from the chapel. Pasa Tiempo is like a small, stylish clubhouse with various options for receptions. We opted for the Lawn Area for a more garden and backyard feel. I chose the biggest tent I can find from nearby suppliers in case of a December rain (and yes there was, unfortunately, a massive downpour in the middle of our reception thus I had a lot of smirking photos). 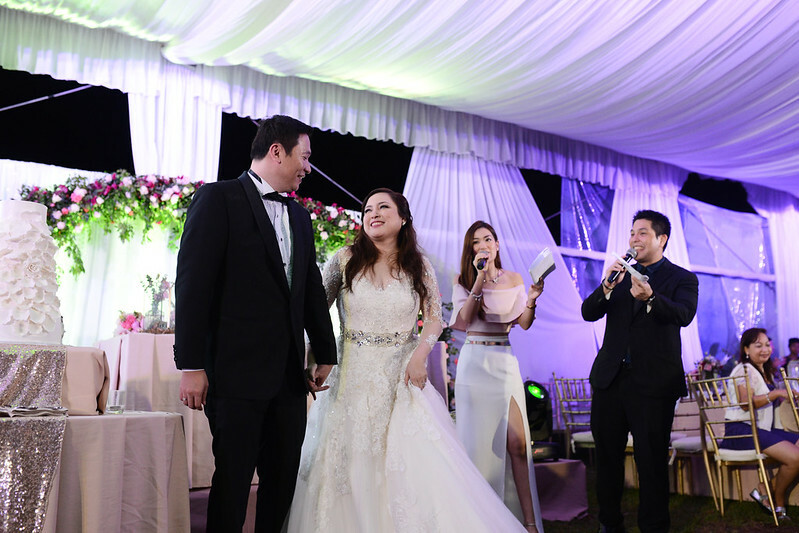 Our 150 guests with a small stage, mini bar, and buffet set-up were accommodated in two big tents provided by Tent King. It rained a bit, so the tents became a bit cramped and the garden soil moist. 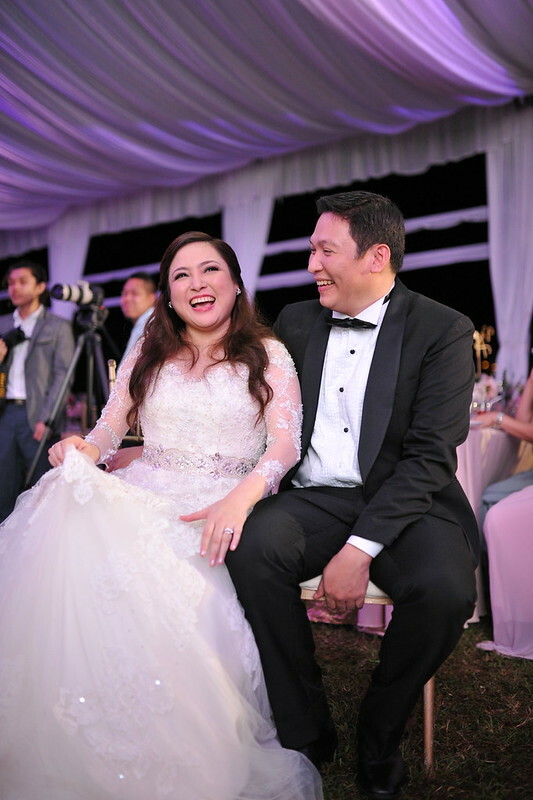 Montecito Nuvali doesn't have preferred or accredited caterers like other venues so we got K by Cunanan. K was my ultimate non-negotiable and we even moved the wedding date so that we can have them. Ours was K's first wedding in Montecito so we had oculars and a lot of meetings prior to the wedding. K was also the one who provided the stage backdrop and our styling for the wedding. I've been receiving a LOT of messages about Montecito so I will just put here the most common questions I encountered. How much is the rate for the chapel? We got a way lower rate when we reserved in December 2014 for our 2015 wedding. I asked for the current rates, and it's now Php 60,000. They usually increase it every year. This is good for four (4) hours with a two (2) hour ingress. This doesn't include the church requirement fees which will be facilitated by St. John Bosco Parish in Sta. Rosa Estates in Laguna Technopark. 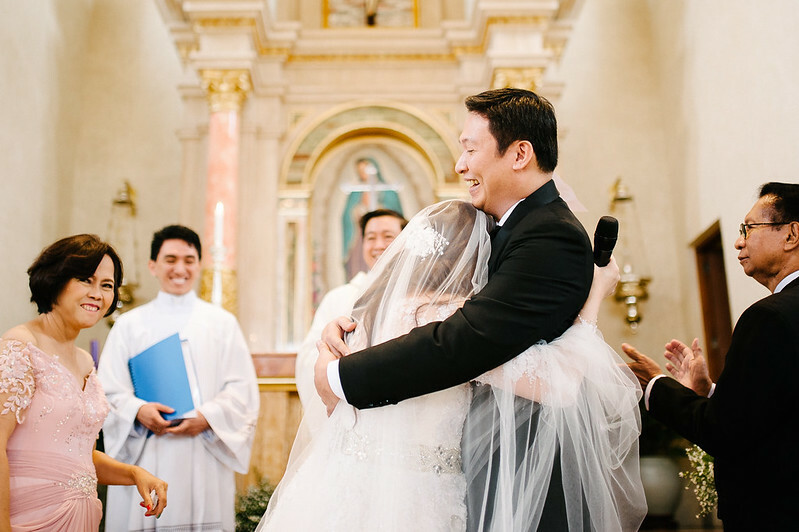 We have to fork an additional Php 10,000 for the marriage certificate, all wedding church requirements, canonical interview, pre-cana seminar, and the wedding priest. 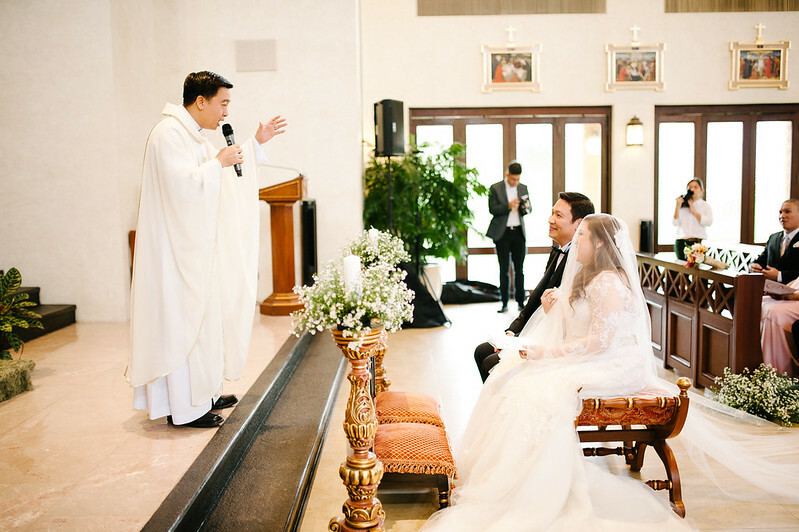 We had our pre-cana in our own parish, and we also asked our family friend to officiate the wedding, but there were no discounts on the rates even if we "outsourced" a lot of things. I blogged some of the details about this and our wedding missalette which can be found here. Do I need to bring any chapel & mass requirements or equipment? Montecito Nuvali has a complete set of mass things needed by the priest, but we brought our own wine and hosts. We also brought flowers and fruits for the offertory. There is also a very lovely loft at the back of the chapel where The Leggiero Strings & Chamber Orchestra, our strings, sang and played during the mass. We just added some speakers and microphones since the chapel doesn't have one. It was JS Mina, our lights & sounds supplier for the reception, who provided these. There are no restrictions in the chapel like wedding time, number of hours, and the like. You just need to coordinate with the admin office the time of your wedding and the ingress required for styling and flowers. Two (2) hours were given to us for the ingress. 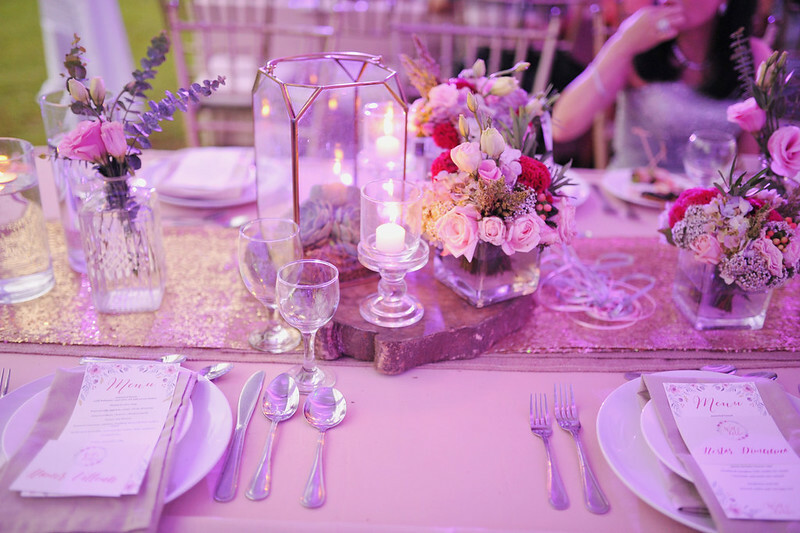 We opted for simple styling because I want to focus on the accents and grandeur of the place. There were no restrictions as well on the details of the mass and the songs to be played. BUT I aligned my missalette and other details with our officiating priest. Where did you hold your reception? 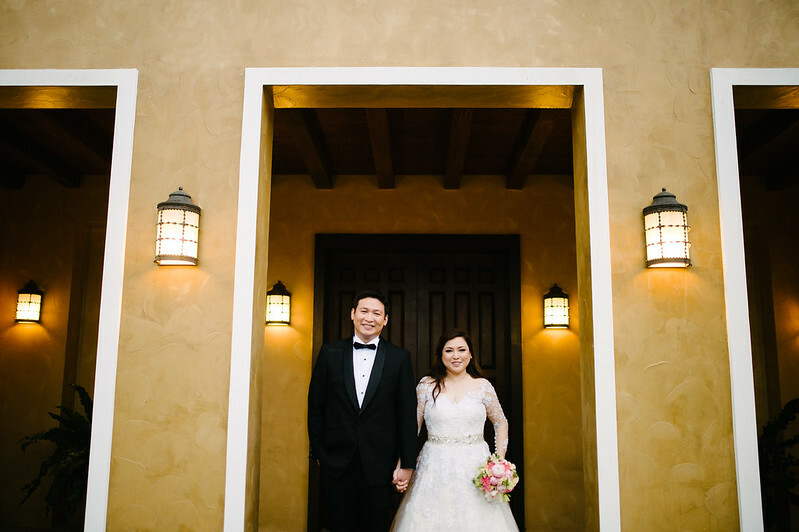 We held our reception at Pasa Tiempo in Montecito, Nuvali. It's a few feet away from the chapel, and it has two areas for the reception. 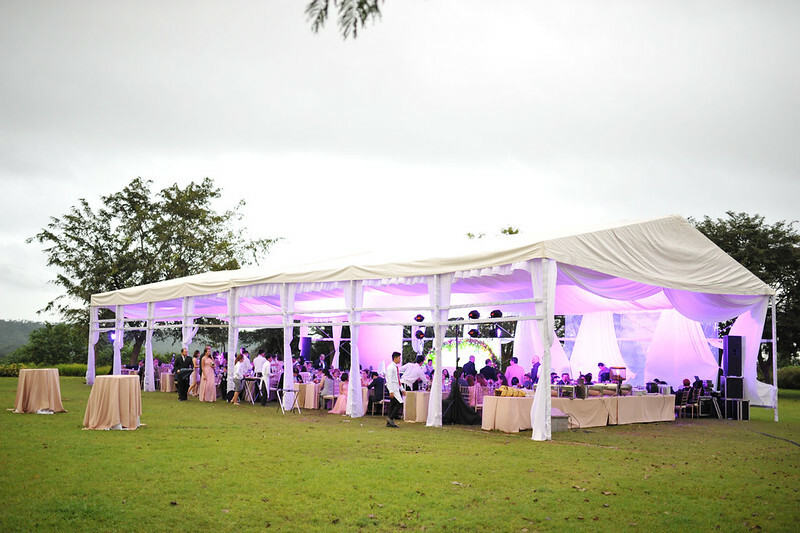 You can choose either the Social Hall or the Lawn Area for your wedding banquet. The Social Hall can accommodate around 100 guests, and it's located on the second floor of the main building. We opted for the Lawn Area and had two big tents. Motecito offers a nice industrial-grade tent trellis (with trusses and roofing) but the ceiling is quite low, and it rented for Php 125,000 back in 2015. We used Tent King instead for our tents. What are the other things I should know if I hold my reception in Pasa Tiempo? 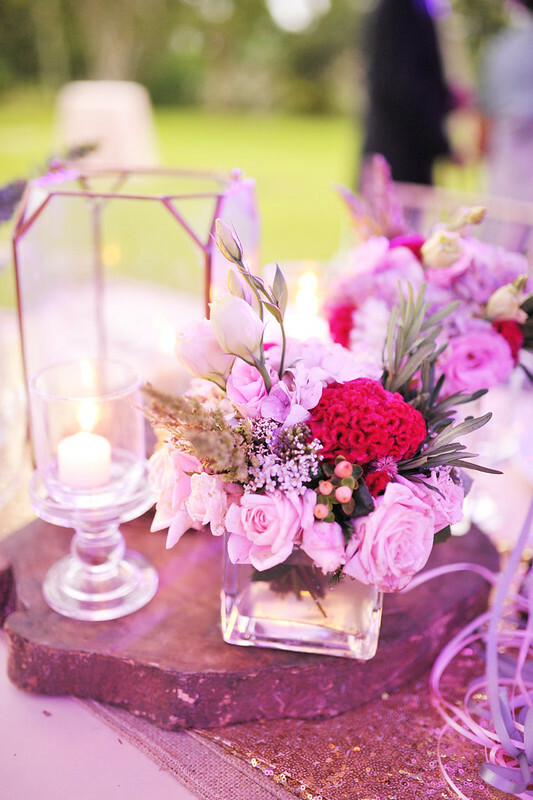 Your event stylist and wedding planner should coordinate everything that you want to do with the Property Manager of Montecito. They have a lot of restrictions concerning the set-up in Pasa Tiempo. I quite remember that the pool is off-limits. You can't put floaters in the pool or even candles surrounding it. There are also electricity requirements which you need to provide for your entire reception set-up so a Generator Set is a must. It was also our lights & sounds supplier who provided this. How much is the reception venue? 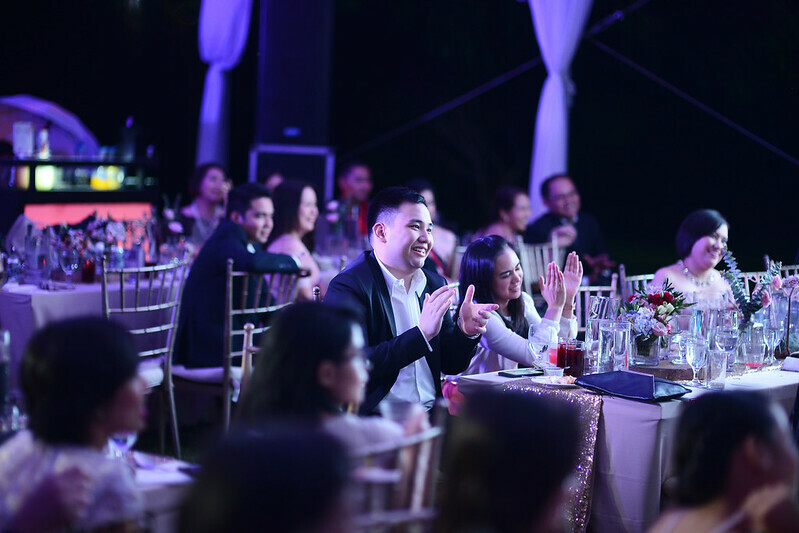 We paid only Php 12,000 for the six-hour reception in 2015, but I believe that it's now Php 40,000 for the Lawn Area and Php 50,000 - 60,000 for the Social Hall. We also paid additional fees for ingress and egress by the hour. This includes the day-before-set-up and day-after-egress of our tents and the early preparation of K by Cunanan. Yes! 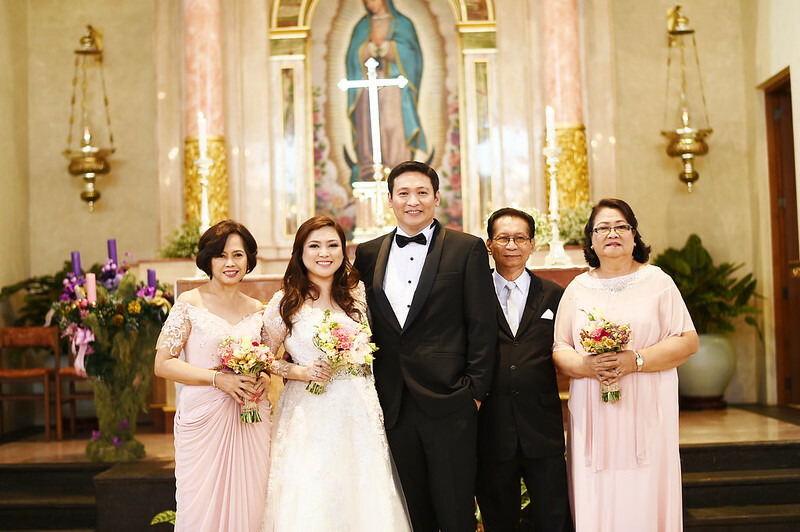 You will need a resident or a lot owner who lives in Montecito Nuvali to sponsor you to be able to hold the wedding and reception in Our Lady of Guadalupe and Pasa Tiempo. Even a mere ocular and entry to the place would need a sponsor. The chapel and the village is very exclusive and unique and they want to maintain it as such; thus they require a hefty security deposit six (6) months before the day of your wedding. 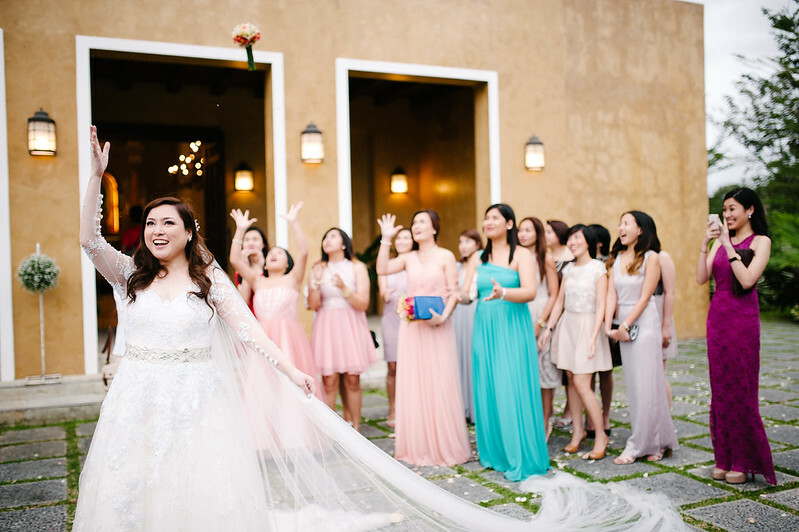 The amount is quite significant - more than the actual rental of both the chapel and lawn area plus some more - and it's a must and a requirement to reserve the place. We easily got the refund one month after our wedding, and they deducted there all the venue fees and additional ingress and egress fees. I hope that this post is helpful to all the brides, grooms, and wedding planners researching about this beautiful place. I cannot stress enough that the chapel is still my most favorite part of our wedding. It was ALL worth it! Let me know if you still need more information about Montecito either by commenting below or via email at abbiereal[at]gmail[dot]com. Let me know as well if you are successful in booking the place and if you'll be a Montecito Bride (or Groom!) like me. ALL photos from this post are from Nicolai Melicor. Hi Miss Abbie! Thank you so much for this comprehensive post! :) Very helpful! You're most welcome! I am happy that I finally got to post this after x million years. Happy Preps! Hi Abbie, are you a land owner in Montecito Chapel? Thanks! Hi Abbie, thank you for this blog! Just for everyone's reference, their 2018 rates are much higher. 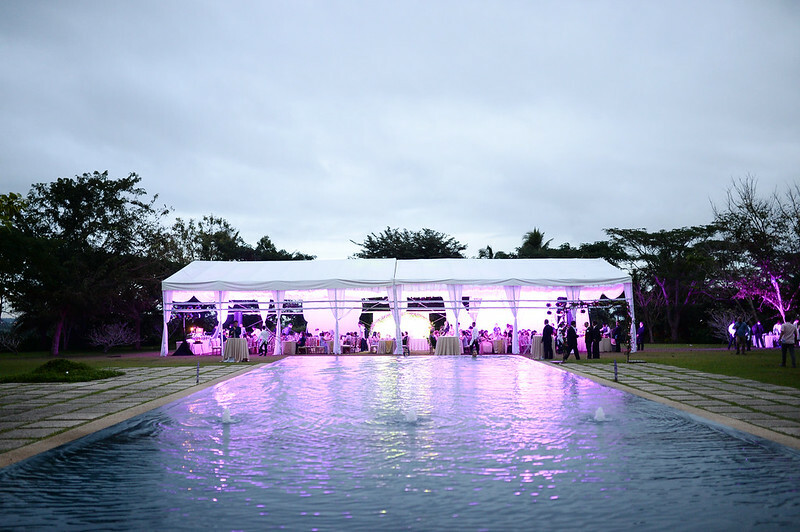 It's Php70,000 for the chapel, while it's Php60,000 for the lawn, with 4,000 charge per hour for ingress and egress and 8,000 on succeeding hours of event proper beyond 4 hours :) The in-house trellis is is about the same rate as other truss tents. Tent King provides cheaper draped tents, but now offers a more expensive, higher type of tent. Forsc Ink may give discounted rates for their truss arc tent. Hope this helps other brides! I believe that it's also in the 60K range for 2018.